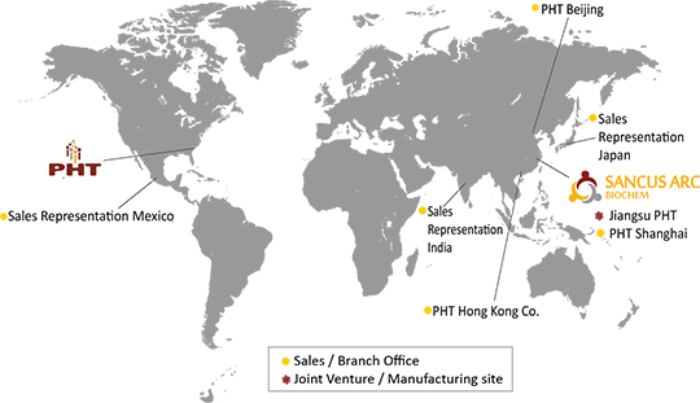 Headquartered in Charlotte, North Carolina, PHT has five international locations. This office handles a majority of the sales, and works with the offices in China to coordinate logistics and quality services. This office manages all procurement services, joint-ventures, and works with the Charlotte office to coordinate logistics and quality services. No. 85, LouShan Guan Rd. PHT Ningbo International Trading Co.
PHT Hong Kong Company, Ltd.
Sancus Arc Biochemical Technology Co.